If you spend a lot of your time working outdoors, it's important to keep your hands not only shielded from most hazards, but warm and comfortable as well. 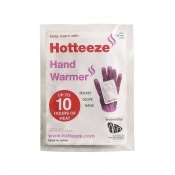 The Hotteeze Hand Warmer is the simple, fast-acting and lasting solution to cold hands. 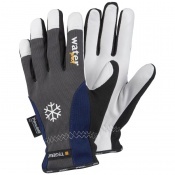 Placed inside your gloves, it can keep your hands warm for up to 10 hours. This listing is for a single pad. 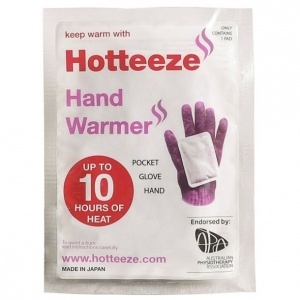 The Hotteeze Hand Warmer is also supplied in a pack of 10 pads. The Hotteeze Hand Warmer can be held in the hand, kept in a pocket or tucked into gloves to keep your hands and fingers toasty warm. 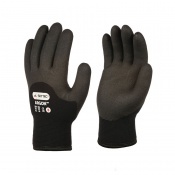 Ultra-thin and odourless, it is unobtrusive in use and provides warmth discreetly. A few minutes after opening, the Hotteeze Hand Warmer will begin to produce heat at an average temperature of 63°C (145.4°F) and will continue to work for up to 10 hours. Because the Hotteeze can be applied rapidly, generates heat quickly and fits easily into a hand or glove, it is ideal for those who spend a lot of time working outdoors or in cold environments, such as cold rooms, or a warehouse. You can easily place it inside your safety gloves and enjoy both the protection of the gloves and the warming effect of the Hotteeze. The Hotteeze works via a chemical reaction that utilises biodegradable natural ingredients. This means that once a pad has been used, it can be simply thrown away in your garden, guilt-free. The contents can be reused as a soil conditioner, contributing to the reduction of wastes, while the outer packet is combustible and does not generate toxic gases.